The person-centered health information system (PCHIS) of the future leverages information technology enhanced by artificial intelligence (AI) to support better, safer, and more affordable health care. The vision presented in this paper describes a system that has less cognitive and administrative burden than current systems and that provides seamless usability for patients and the multidisciplinary teams that care for them. 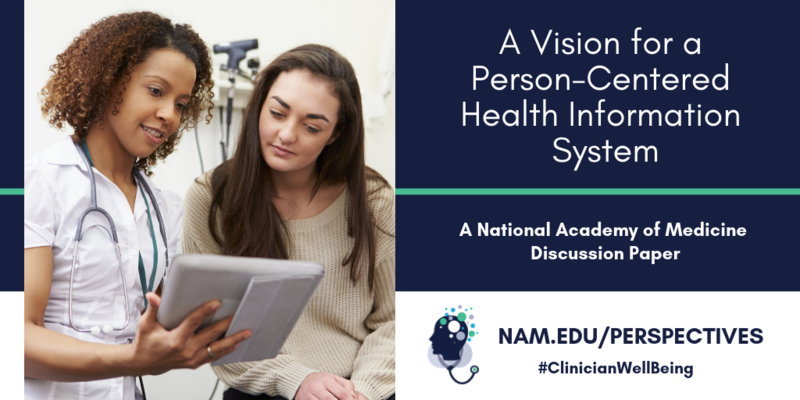 Further, the PCHIS vision presented in this paper supports the evolving definition of high-value care, which includes the simultaneous provision of acute, chronic, and preventive care and promotion of patient wellness. The system in this vision makes health information technology easily accessible and clinical data easily understood by the clinician and patient, while making administrative tasks and billing secondary functions. The PCHIS revolutionizes how health care is delivered and information is used. It provides a customizable interface for each clinician and patient and gives each the ability to collect and use the same data. In short, the system leverages knowledge from the entire care team, including the patient, to improve care. Reliance on current electronic systems for documentation and reporting has shifted clinicians’ time away from human interaction to device interaction, fueling dissatisfaction on the part of both patients and clinicians. 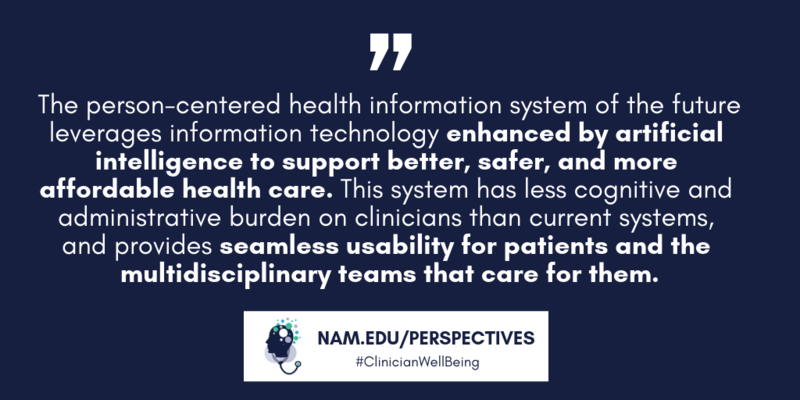 Authors of a recent NAM Perspectives paper, “Care-Centered Clinical Documentation in the Digital Environment: Solutions to Alleviate Burnout,” demonstrated the strong relationships among clinical documentation, the use of electronic systems that support documentation, and clinician burnout . Doctors and nurses spend up to 50 percent of their clinical encounters completing clinical documentation and up to several hours per week outside of encounters documenting in the electronic health record (EHR) . Many clinicians have attributed a sense of futility that can lead to burnout to the time spent on nonclinical activities [2,3]. Similarly, in outpatient settings, patients describe clinical encounters as ones in which team members go through duplicative, often mundane, questions and computer documentation with little time devoted to eye contact, dialogue, or the performance of physical exams . The current electronic systems for documentation do not work for clinicians or patients. Patients and clinicians desire technology that facilitates access to and use of health information and communication tools leading to quality, person-centered care. This paper sets out a vision for a system with reduced administrative burden and enhanced clinical care and knowledge sharing capabilities that work for all members of the care team—especially the patient. The vision identifies the features necessary to overcome the challenges of current EHR functionality, such as the cumbersome methods of parsing through massive amounts of data to locate critical information. It also emphasizes the need to integrate and standardize data and increase its accessibility. Throughout the paper, the terms “vision” and “PCHIS” are used to refer to the future state outlined by the authors and “view” is used to refer to what patients and clinicians see on a screen or data display. is interoperable and secure, and has the ability to support seamless information flows when desired and/or appropriate, regardless of its storage location. 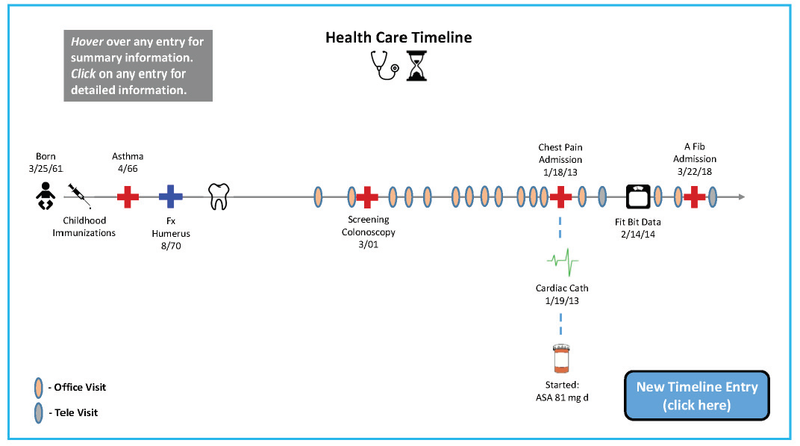 The automated integration of a patient’s records across information systems to enable a comprehensive, longitudinal view (as illustrated in Figure 1) is essential in promoting comprehensive harmonized care . In the PCHIS of the future, this information is accessible through multiple devices, including the patient’s phone. Within these front-end systems and user interfaces, appropriate data for the current context are provided. Based on the context, such as the type of visit, and a clinician or patient’s preferences, the most appropriate information populates the individual user interface. Regardless of the platform used by the clinician, the information recorded is immediately available across systems. SOURCE: Horvath, K., P. Sengstack, F. Opelka, A. B. Kitts, P. Basch, D. Hoyt, A. Ommaya, P. Cipriano, K. Kawamoto, H. L. Paz, J. M. Overhage. 2018. A vision for a person-centered health information system. NAM Perspectives. Discussion Paper, National Academy of Medicine, Washington, DC. https://doi.org/10.31478/201810a. The PCHIS synthesizes relevant text-based information, such as clinical notes, reports concerning tests, and other clinical information, and it creates necessary documents on demand, such as the patient history. Such documents would require review by the clinician to ensure accuracy, incorporation of specialty-specific information, and contextual relevance (e.g., clinical setting and other factors). Thus, auditable notations and additions can be made in a living document accessible for multiple purposes. 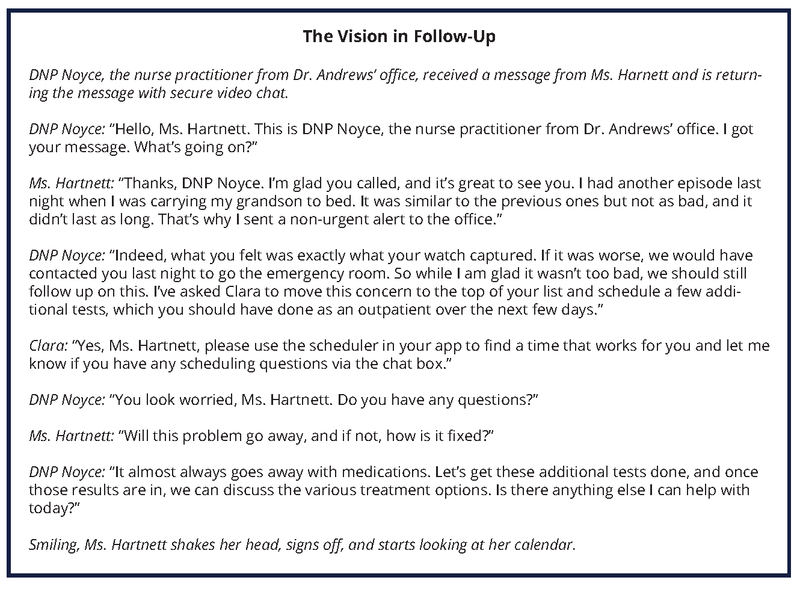 The current approach produces repeated text by each physician, nurse, and clinical caregiver. In the PCHIS, textual or graphical views illustrate patient-centered and clinical care team–entered data or documentation. The system facilitates interaction through a variety of portals and allows the health care team to seamlessly interact and communicate regarding patient data and input. The PCHIS also allows views customized to accepted clinical guidelines and standards (e.g., conformance of the care of a congestive heart failure patient with the New York Heart Association guidelines). In the clinician view, an alert hot link reveals the level of compliance with the guidelines in an easy-to-understand, graphical depiction. Paramount is that patients have access to all their data, including lab results, images, reports, and clinician notes. In the PCHIS, a secure and patient-friendly view has contact and credential information for all patient health care team members. It also has insurance information. This Health Insurance Portability and Accountability Act of 1996 (HIPAA)-compliant view is universal and thus extends beyond the current concept of a “tethered” patient portal (i.e., fully interoperable and comprehensive). It is accessible from smartphones, tablets, and computers. Each patient can use a single view that integrates information for all health and health care data. The portal also incorporates patient-generated data from questionnaires and wearable devices. Patients are able to communicate with their health care team members through this vehicle via appropriate mechanisms such as secure text, e-mail, and video conferencing. To handle these enhanced communication approaches, clinicians and care team members develop triaging methods and communication protocols. Importantly for both the patient portal and the larger integrated data infrastructure, there must be accurate and efficient mechanisms for amalgamating data, resolving discrepancies, and removing duplicate data. The PCHIS enables patient interaction through mobile interfaces and by using patient-friendly representations (Figure 1): e.g., a mobile application that reports air quality and pollen for a precise location in which an asthmatic patient resides. This application alerts the patient to less than ideal conditions and immediately prompts the patient to check her pulmonary status. This information, collected through mobile applications, is immediately shared and enables alerts to patients, caregivers, and clinicians. In the PCHIS vision, the patient and other members of the health care team have access to machine learning and other AI capabilities to provide data-driven guidance concerning conditions and individualized integration of all health information. Additionally, patients play an integral part in usability design to develop the representations that are meaningful to them. The patient portal can access credible sources of medical information, cost information, clinician quality information, and a vetted tool kit of resources for personal health, disease management, health maintenance, nutrition, and fitness. Patients are encouraged to enter relevant data—such as lifestyle choices, housing situation, food security, and mood—in addition to their medical and social histories. 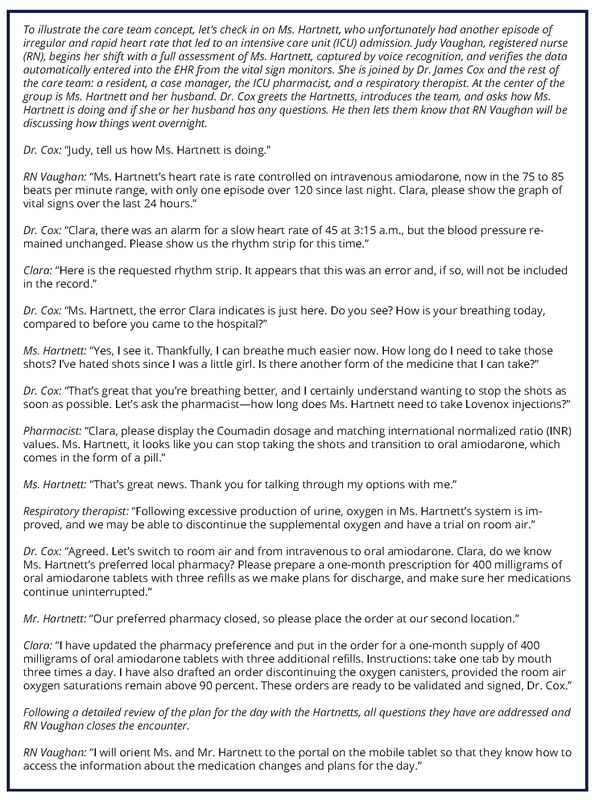 After an encounter with the health care system, the patient view displays a post-visit summary with key components of the visit, including procedures completed, summary of shared decision-making discussions, instructions, actions required of both the patient and health care team members, date and objective of the next visit, and medication reconciliation. Additionally, when patients view their health records, the PCHIS includes information and trends that facilitate their engagement and education. The PCHIS vision allows clinicians to view data specific to acute and chronic care and provides a meaningful display of patient status, including longitudinal and clinically relevant data. It identifies subtle but important changes that occur over time and projects the data to identify trends that require intervention. It incorporates clinician and patient learning, and it collects and displays longitudinal data from a variety of sources, including mobile health devices. In addition to highlighting abnormal parameters, the display indicates the trajectories of those parameters to allow system users to assess patient status and intervene in a timely manner, if required. The PCHIS structure facilitates the understanding of patient concerns (e.g., reason for visit, chronic conditions, preventive checks), context (e.g., present history, past history, family history, social history, environmental setting), correction (e.g., diagnosis and treatment plans), and cost or value (e.g., out-of-pocket cost, insurance coverage, recovery time, need for rehabilitation, return to work, and expected outcomes). This is illustrated in Figure 2. NOTES: The screen contains a list of concerns (e.g., reasons for seeking medical attention, chronic conditions, preventive checks). Clicking on the concern leads to context (e.g., present history, past history, family history, social history, environmental setting) generated by the patient and caregivers. Also noted is the correction (e.g., testing and treatment plan) for each concern. Additionally, cost information would be provided for all care, focusing on the out-of-pocket expenses the patient could incur. There is a person-centered app (lower right corner) that provides information on where a patient lives and works. 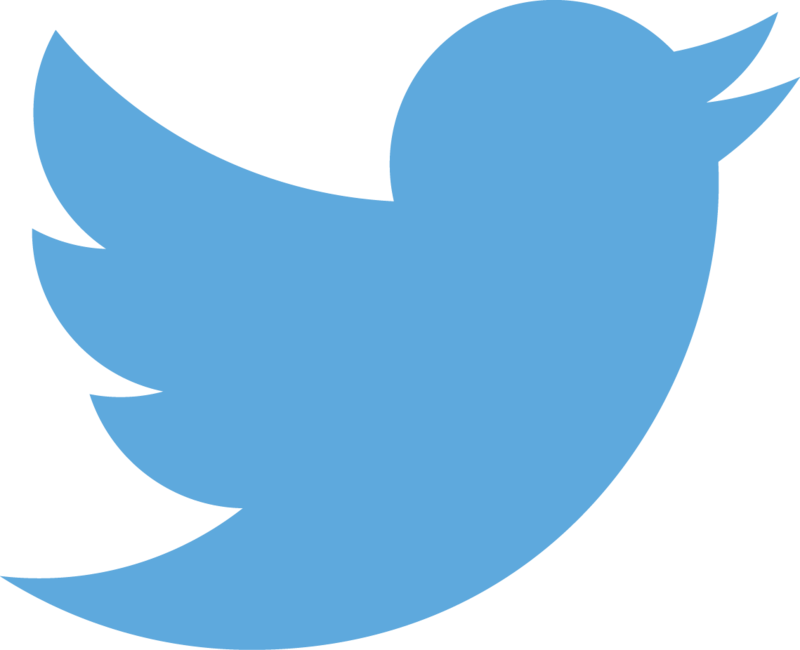 This information is manually entered or received from automatic synching with other devices. The calendar is easily accessible. It can be used for scheduling and providing reminders for acute, chronic, and preventive issues. It is integrated with the user’s work and personal calendars. Views for preventive care show previous results and the next action due. They also show a view of ordered, but not completed, interventions in a meaningful and actionable format. For example, if a patient is overdue for a mammogram but has not used two previous referrals, the PCHIS would indicate both the recommendation for a mammogram and the unused referrals. This information enables the clinician and patient to have a shared decision-making discussion on breast cancer screening and mammography, instead of ordering a third mammogram that is not likely to be completed. 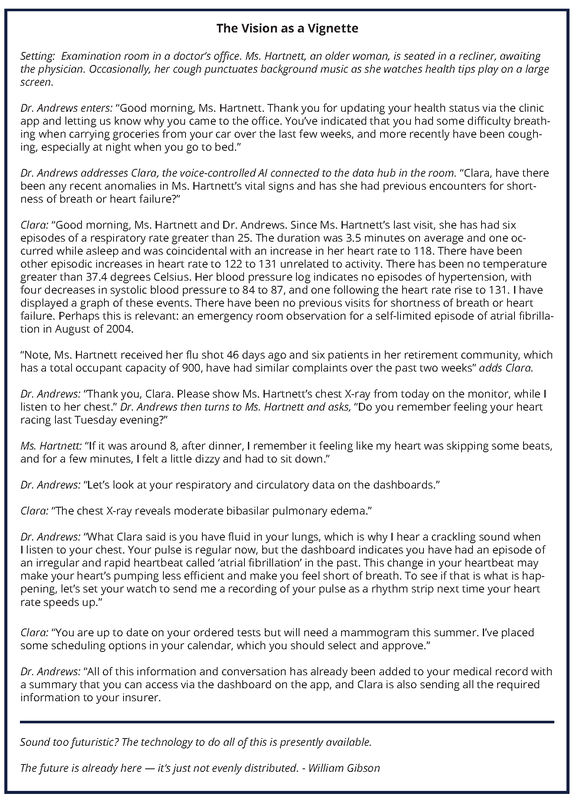 Ideally, this feature would help ensure better patient outcomes and more meaningful conversations between clinicians and patients. For clinicians in settings where care is administered to groups of patients, the PCHIS of the future displays that group of patients and includes key information needed to support effective workflow and care, while supporting the protection of personal health information. For example, in acute care settings, nurses typically care for a cohort of patients during a given shift. In the vision this paper holds, the system’s display prioritizes the needs of patients based on acuity, medications due, and treatments needed. Through algorithms, it determines potential issues that need to be addressed proactively, such as subtle signs of sepsis, or the need to involve case management. Other clinicians—including respiratory therapists, nutritionists, and occupational therapists—are able to visualize their group of assigned patients to review and contribute to the care plan, set schedules based on other patient activities, and communicate easily with all members of the health care team. This would not only allow more efficient work on the part of the clinician, but would also again help ensure that patient needs are met and prioritized most efficiently and accurately. Ensuring that the system does not overburden clinicians or patients with text and data entry is an important concern. Tools that can record key encounter information, voice recognition to capture clinician assessments and plans, AI, and natural language processing to minimize the need to search for relevant prior information are all critical in reducing clinicians’ data entry so that they can spend more time interacting with patients. The PCHIS of the future minimizes the need for hospital information technology (IT) staff to conduct analysis and retrieve data for research projects. The system also minimizes the amount of time it takes for a patient to retrieve their own data. The PCHIS supports effective and efficient collaboration and communication between the entire clinical care team and the patient. For example, health concerns and problems would be presented at a level of detail—including the diagnostic specificity achieved (e.g., how a cough resulted in pneumonia, then progressed to bacterial pneumonia, and finally to pneumococcal pneumonia)—that appropriately reflects the user’s context. These concerns would then be linked or shared across the care team. Additionally, where multiple clinicians are caring for the same patient, the PCHIS would indicate which clinician (or clinicians) is primarily responsible for a particular condition and treatment or medication and which team members are actively monitoring or addressing concerns, common goals for concerns, and the outcomes expected and achieved related to these concerns. Similarly, a shared longitudinal plan will facilitate engagement and awareness across the entire care team, the patient, and caregivers. The organization of data within the PCHIS allows for robust communication with a variety of stakeholders, including insurance companies, government agencies, worker compensation programs, and others as needed. The connections and interfaces allow for automated transactional communication, such that clinician and patient burden is minimized. The main constraints around developing the PCHIS of the future are not technical; in fact, much of the technology described in the scenarios and other sections of this document are used in other settings (e.g., Google Cloud AI tools). These technologies will need to be advanced and refined for the health care setting and to realize the PCHIS vision, some of the technology will need to be updated, integrated, or edited to fit the newly refocused system. The constraints mainly involve our health care system’s documentation requirements, collaboration between vendors, and consideration of workflow, and, to some extent, patient concerns around privacy and adoption of new technologies. The following barriers have been identified and will need discussion, support, and action from the health care community, including health IT vendors, health care organizations, the federal government, health IT standards organizations, insurers and payers, and regulatory agencies. Most EHRs are built on legacy technologies as transactional systems to record information essential for billing. Many of these systems were not built as interactive digital platforms that can optimize health and health care through the use of machine learning and AI to achieve broad, comprehensive communication. It will be important to retrofit or reconfigure the current structure with what is needed. While most EHRs were built to support billing and coding, they have not been optimized to support these features—hence, the continued existence of administrative tasks, which often require duplicative documentation and, in many cases, still require paper forms. The burden of administrative tasks can be reduced through transparency of payer coverage rules and administrative interoperability (between clinicians and payers). Evaluation and management documentation guidelines will need to be refined so that clinicians can fully use new information systems. The sharing of data among EHR vendors has progressed but still presents a challenge. Vendors, health systems, and clinicians will need to assist with the adoption of information standards to enhance interoperability, and clinicians will need to agree to capture the data according to those standards. Health information technology and informatics resources (such as human capital) will be needed to help build, test, implement, manage, and evaluate these systems. The costs associated with new systems, their updates, and implementation of new capabilities are usually a challenge to an organization’s bottom line. Organizations also require time for implementation and training. While health care organizations may expect their EHR providers to evolve their systems to provide PCHIS capabilities, this is unlikely to happen unless there are additional revenue opportunities for EHR providers that drive new development. It is reasonable to expect that some patients may have privacy and trust concerns when using a PCHIS with advanced AI capabilities and may find it hard to initially adopt this new technology. To enable true interoperability, rigorous standards—and universal adoption of those standards—are needed for the many thousands of events and concepts in health care. This standardization will also be critical to support consolidation and de-duplication of data across systems and to provide meaningful decision support and analytics. Achieving computable solutions will require detailed clinical models with well-defined terminologies, methods, and standards that facilitate computer-based communication. The PCHIS will build on the following efforts but extend them significantly. Systematized Nomenclature of Medicine—Clinical Terms (SNOMED CT): The purpose of SNOMED CT is to encode the meanings of terminology that are used in health information and to support the effective clinical recording of data, with the aim of improving patient care. SNOMED CT provides the core general terminology for electronic health records (https://www.snomed.org). Logical Observation Identifiers Names and Codes (LOINC): LOINC applies universal code names and identifiers to medical terminology related to electronic health records. LOINC is one of the standards used in the electronic exchange of clinical health information in US federal government systems (https://loinc.org). RxNorm: RxNorm provides normalized names for clinical drugs and links its names to many of the drug vocabularies commonly used in pharmacy management and drug interaction software. By linking between these vocabularies, RxNorm mediates messages between systems that do not use the same software and vocabulary (https://www.nlm.nih.gov/research/umls/rxnorm). Fast Healthcare Interoperability Resources (FHIR) profiles: FHIR is a standard used when exchanging health care information electronically (http://hl7.org/fhir). Many clinicians understand the step-by-step processes of a clinical pathway and the many processes in the workflow. Turning those clinical logic models into computable logic models will require the collaboration of experts in computable knowledge engineering and clinical experts. The security mechanisms for some of these approaches need further refinement to be more nuanced fine-grained so that, for example, providing access to a SMART app for a patient’s blood glucose levels does not require also giving the app access to the patient’s other lab results, such as HIV test results. The scope of data supported by FHIR by information systems, needs to be more comprehensive. The definitions of the US Core FHIR profiles need to be more specific to allow interoperability so that, for example, references to a medication’s route (e.g., by mouth, IV) use standard terminology rather than something that is vendor or institution specific. These data interfaces need to enable the ability to write data into a system, rather than only being able to read data out of a system. The integration points for CDS Hooks are supported only to a limited extent, with most vendors starting with the hook of a patient’s chart being opened. Many EHR vendors are moving forward with approaches for integrating executable clinical knowledge, particularly with respect to SMART in combination with FHIR (known as SMART on FHIR), as well as CDS Hooks. Once these executable knowledge applications and services are built, they can be deployed into a compatible digital platform, such as a patient portal or an EHR. 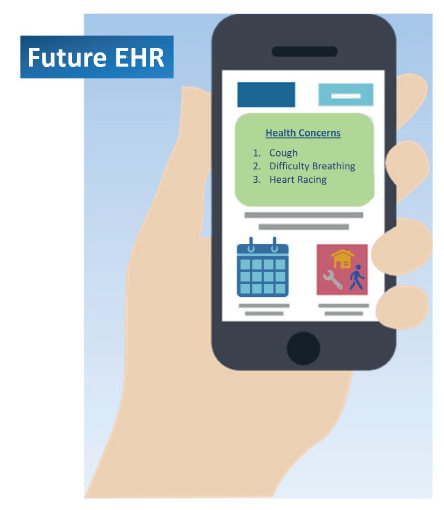 EHR vendors are generally taking an “app store” approach to the support of such application programming interfaces (APIs); they plan to monetize these add-ins, similar to how Apple or Google monetizes apps sold on their smartphone platforms. Such a financial incentive will hopefully lead to greater support for and capability in these API platforms. It remains unclear what degree of vendor-specific customization will be required for applications due to vendor-level differences in how they have implemented the APIs. In addition, such apps must prioritize interoperability to fully support the PCHIS vision. The PCHIS of the future provides and contributes to quality and outcome data that can be used to support the generation of specific patient outcomes data and real-world evidence. As patients can receive care through multiple health systems and ambulatory settings, those seeking data can face the issue of completeness of data capture. Thus, clinical research studies often require data from several health information systems. This type of data collection requires careful planning to determine approaches that address potential concerns of privacy, data security, quality, definitions, difficulty with data mapping, nonstandard information models and terminology, and other issues. Data linkage across systems and platforms could be significantly aided by the use of a unique patient identifier. Although the unique patient identifier has been implemented in other countries such as the United Kingdom, the US Congress has extended a “prohibition against HHS [Department of Health and Human Services] using funds to promulgate or adopt any final standard providing for the assignment of a unique health identifier for an individual until such activity is authorized” . However, in the fiscal year 2017 omnibus appropriation bill, it was noted that “this limitation does not prohibit HHS from examining the issues around patient matching” . HHS should continue work with stakeholders to examine standards for patient matching. In addition to linking patient data, defining data formats for structured and unstructured data is a critical need. There are a wide variety of data models and standards in use. Common data models such as PCORnet and the Food and Drug Administration’s Sentinel project provide useful approaches . The PCHIS would use a widely accepted core minimal dataset and expand on it through platforms such as the Healthcare Services Platform Consortium (https://www.hspconsortium.org), the HL7 Clinical Information Modeling Initiative (www.hl7.org/Special/Committees/cimi/index.cfm), the HL7 US Core FHIR profile initiative (http://www.hl7.org/fhir/us/core), and the US Core Data for Interoperability (https://www.healthit.gov/hitac/events/us-core-data-interoperability-7) effort. The PCHIS effort will also facilitate quality improvement and value-based purchasing studies. The PCHIS would automatically populate quality metrics (e.g., hospitalization rates, adverse events, patient-reported outcomes). Analytics related to these data would be enabled in a scalable, standards-based manner, such as through use of the HL7 Clinical Quality Language and the HL7 FHIR Clinical Reasoning Module. The PCHIS would use a dynamic consent model in which patients can control, in one place, their ongoing participation in research projects and use of their data. As cybersecurity threats continue to evolve, the system would involve active security practices, such as encryption, but it would also leverage institutional efforts focused on training, network and physical control, and other measures as appropriate. EHRs contain a large volume of phenotype data. Important details for research are often captured in unstructured data (e.g., discharge summaries, imaging, and pathology reports) . The PCHIS of the future would allow for analysis of these data through use of natural language processing and AI. The system would enable the sharing and use of validated phenotypic algorithms using scalable, standards-based approaches on demand. These algorithms may be based on codes or language processing techniques but can be used across all relevant systems. The PCHIS would also provide linkage to DNA and biorepository information to facilitate research for willing participants as appropriate. Additionally, the system would facilitate ad hoc informed consent as needed for pragmatic clinical trials. The PCHIS vision is achievable over the next five years. To enact it, vendors and institutions must prioritize efforts to enhance the patient experience, reduce clinician burden, and make information flow and key health care operations easier. Wherever clinicians are asked by regulators or their organization to specifically address key issues—such as blood pressure control, lung cancer screening, or diabetes prevention—leveraging technology or enhancing team care coordination can result in a corresponding reduction in time burden. Additionally, patient engagement is dependent on streamlined processes that facilitate information flow, usability, and communication with the clinical care team. As a strategy, health care organizations should focus available resources and influence to make this vision achievable. We have selected these key features of the PCHIS of the future based on their potential to reduce administrative burden and enhance clinical care and knowledge transfer for the care team, including the patient. As illustrated in the vignettes, the PCHIS of the future facilitates engagement of the entire clinical care team, including the patient and other caregivers, to ensure that all concerns and wellness goals are fully supported and coordinated. It allows for greater interdisciplinary communication and shared decision making. The system supports clinical workflow, leveraging anticipatory decision support to reduce clicks and errors of omission, and aids real-time clinical decision making and placing orders. In addition, the PCHIS analyzes and predicts meaningful deviation from usual plans. Alerts are generated only for issues that require clinician management, in contrast to the overload of alerts that many clinicians experience today. The PCHIS allows patients and clinicians to aggregate and analyze details of health information, enabling faster and enhanced decision making. This analysis and review of data will help ensure better patient outcomes and will allow clinicians and patients to more easily make decisions that are of greatest concern to patients’ health. This analysis and review of data can also facilitate improvement of data quality and its usability for research. Additionally, the system facilitates health care and wellness decision making by enhancing clinical care team and patient interactions, through context-enabled presentation of trend data, and through appropriate reminders and recommendations of care pathways. 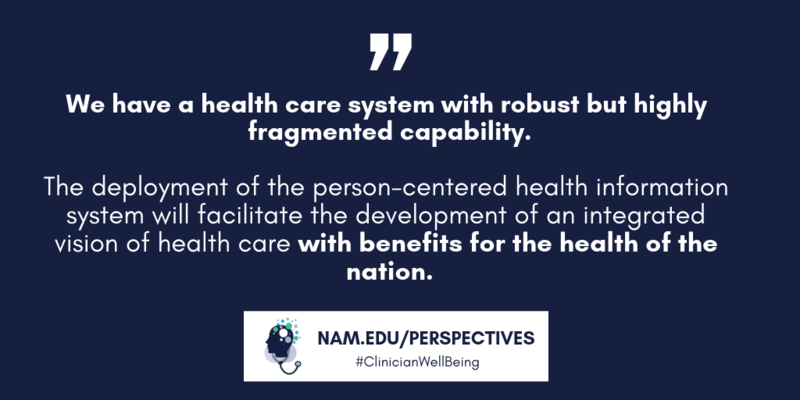 The development of personalized health and health care plans is key and should consider individual conditions, social determinants of health, and treatment preferences, resulting in clinician and patient commitment to the care plans. The PCHIS also facilitates increased engagement and commitment to preventive services and treatments. While changing, current payment policy still primarily values procedures and visit-based evaluation and management services. Even where payment is structured globally (such as a per-member, per-month payment), internal attribution of relative value units of clinician work is still most often tied to visit-based markers of care. The PCHIS encourages optimal use of existing information and discourages unnecessary duplication of services and information. This system facilitates alignment of care processes with what is best for the patient. This alignment will likely lower health care costs by providing optimum care and eliminating unnecessary and duplicative interventions. For the PCHIS to be optimally and consistently used, payment policy needs to continue to evolve such that it is better aligned with the vision presented. The proposed system is introspective. It continuously captures data about its performance and impact on care processes, and these data are automatically used to refine the system. Delivering health care is complicated—but health care information systems that support delivery can and should be simplified. The PCHIS vision also supports use of current guidelines and includes tools for patient education and shared decision making. Where feasible and appropriate, automated decision support would suggest diagnoses, treatments, or orders. For example, if the patient meets all relevant criteria (recent data, labs, timing), a medication refill request would be made automatically by the system, with only a single click required by the clinician to approve the request and simultaneously notify the patient. The PCHIS would also learn from users and identify and display efficient approaches to the development of system improvements after appropriate review. ONC, vendors and software developers, hospitals and health systems, and clinicians should collaborate to set and implement interoperability standards including comprehensive and detailed clinical models for prioritized use cases, and vendor support for extracting and inputting data for the adopted standards. Vendors and software developers, hospitals and health systems, and clinicians should enhance the use of interfaced applications and services (e.g., SMART on FHIR, CDS Hooks, and knowledge representations standards such as Clinical Quality Language). The Centers for Medicare and Medicaid Services, in collaboration with clinicians, and vendors and software developers, should refine evaluation and management documentation guidelines to reduce excessive documentation and promote the use of new information systems to their fullest potential. Hospitals and health systems should accelerate plans to replace legacy systems with new systems and fund their updates and the implementation of new capabilities. These new systems or updates will also require resources and time for implementation and training. Vendors and software developers should further develop technologies such as artificial intelligence and natural language processing, and provider organizations should test them in the clinical environment. To ensure the PCHIS system works for patients and clinicians, these stakeholder groups should be included in the design and rollout of these new systems. The United States has a health care system with robust but highly fragmented capability. The deployment of the PCHIS vision described in this paper will facilitate the development of an integrated vision of health care that will benefit the nation. Ommaya, A. K., P. F. Cipriano, D. B. Hoyt, K. A. Horvath, P. Tang, H. L. Paz, M. S. DeFrancesco, S. T. Hingle, S. Butler, and C. A. Sinsky. 2018. Care-centered clinical documentation in the digital environment: Solutions to alleviate burnout. NAM Perspectives. Discussion Paper, National Academy of Medicine, Washington, DC. https://nam.edu/wp-content/uploads/2018/01/Care-Centered-Clinical-Documentation.pdf. Dyrbye, L. N., T. D. Shanafelt, C. A. Sinsky, P. F. Cipriano, J. Bhatt, A. Ommaya, C. P. West, and D. Meyers. 2017. Burnout among health care professionals: A call to explore and address this underrecognized threat to safe, high-quality care. NAM Perspectives. Discussion Paper, National Academy of Medicine, Washington, DC. https://nam.edu/wp-content/uploads/2017/07/Burnout-Among-Health-Care-Professionals-A-Call-to-Explore-and-Address-This-Underrecognized-Threat.pdf. Staggers, N., B. L. Elias, E. Makar, and G. L. Alexander. 2018. The imperative of solving nurses’ usability problems with health information technology. Journal of Nursing Administration 48(4):191-196. Payne, T. H., S. Corley, T. A. Cullen, T. K. Gandhi, L. Harrington, G. J. Kuperman, J. E. Mattison, D. P. McCallie, C. J. McDonald, P. C. Tang, W. M. Tierney, C. Weaver, C. R. Weir, and M. H. Zaroukian. 2015. Report of the AMIA EHR-2020 Task Force on the status and future direction of EHRs. Journal of the American Medical Informatics Association 22(5):1102-1110. Healthcare Information and Management Systems Society. 2017. After nearly two decades, a win in Congress for patient data matching. https://www.himss.org/news/after-nearly-two-decades-win-congress-patient-data-matching (accessed September 27, 2018). National Patient-Centered Clinical Research Network. N.d. http://pcornet.org; and US Food and Drug Administration. 2018. FDA’s Sentinel initiative. https://www.fda.gov/safety/fdassentinelinitiative/ucm2007250.htm (accessed September 27, 2081). Hemingway, H., F. W. Asselbergs, J. Danesh, R. Dobson, N. Maniadakis, A. Maggioni, G. J. M. van Thiel, M. Cronin, G. Brobert, P. Vardas, S. D. Anker, D. E. Grobbee, and S. Denaxas. 2018. Big data from electronic health records for early and late translational cardiovascular research: Challenges and potential. European Heart Journal 39(16):1481-1495. Keith Horvath, MD, is Senior Director of Clinical Transformation in Health Care Affairs at the Association of American Medical Colleges. Patricia Sengstack, DNP, RN-BC, FAAN, is Associate Professor, Vanderbilt University School of Nursing. Frank Opelka, MD, FACS, is Medical Director of Quality and Health Policy, American College of Surgeons. Andrea Borondy Kitts, MS, MPH, is Patient Outreach and Research Specialist at Lahey Hospital & Medical Center. Peter Basch, MD, MACP, is Senior Director of IT Quality and Safety, Research, and National Health IT Policy, MedStar Health. David Hoyt, MD, FACS, is Executive Director of the American College of Surgeons. Alexander Ommaya, DSc, is Senior Director at the Association of American Medical Colleges. Pamela Cipriano, PhD, RN, NEA-BC, FAAN, is President of the American Nurses Association. Kensaku Kawamoto, MD, PhD, MHS, is Associate Chief Medical Information Officer and Vice Chair of Clinical Informatics at the University of Utah Health. Harold L. Paz, MD, MS, is Executive Vice President and Chief Medical Officer at Aetna. J. Marc Overhage, MD, PhD, is Chief Medical Informatics Officer and Vice President of Intelligence Strategy at Cerner. The authors would like to acknowledge Robert Califf, MD, Duke University School of Medicine, and David Meyers, MD, Agency for Healthcare Research and Quality, for their valuable contributions to this paper. The authors would also like to thank Charlee Alexander, program officer; Mariana Zindel, research associate; and Imani Rickerby, senior program assistant at the National Academy of Medicine for the valuable support they provided for this paper.